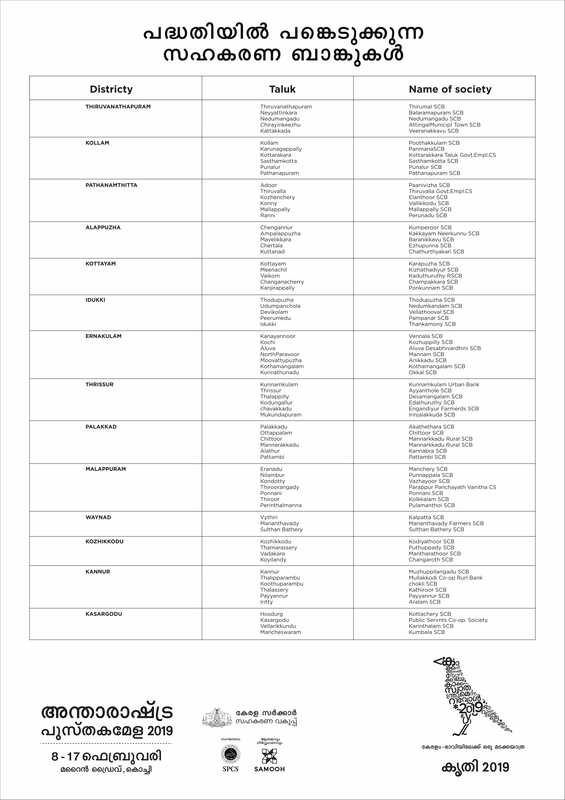 List of co- operative banks where books can be donated for participating adopt libraries program. Kerala, the most literate Indian state where reading is in the blood of common man and freedom of expression is sacrosanct, is at the forefront of nurturing a literary eco system that transcends beyond boundaries. Today, the Government of Kerala takes a leap and brings together literary lovers across the globe through an international platform – International Book Fair 2019. The fair which will be held from 8th -17th February 2019 at the Marine Drive grounds, Kochi, Kerala, will be a one of kind platform for international, national and local publishers who wish to reach out to the most well informed audiences with a rich literary lineage. International Book Fair 2019, Kochi. © copyright 2018 SPCS. Alright reserved.